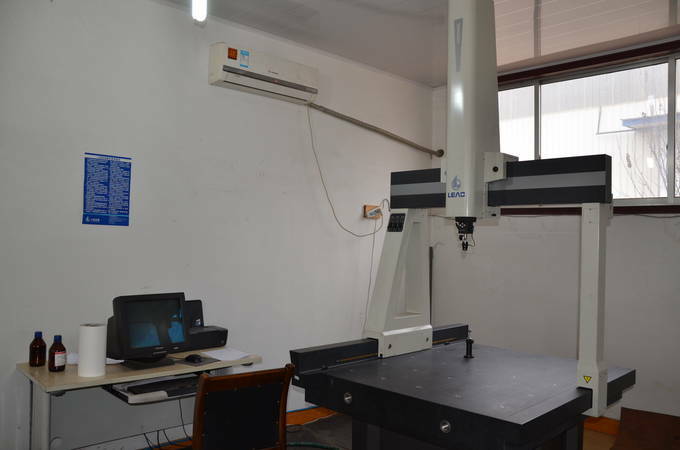 CMM, full name is Coordinate Measuring Machine, is the most accuracte device that measures the dimensions of steel forgings. It is operated by sensing discrete points on the surface of forged part with a probe. During the inspection process, various types of probes are used in CMMs, including mechanical, optical, laser, and white light. Depending on the machine, the probe position may be manually controlled by an operator or it may be computer controlled. CMMs typically specify a probe’s position in terms of its displacement from a reference position in a three-dimensional Cartesian coordinate system (i.e., with XYZ axes). In addition to moving the probe along the X, Y, and Z axes, many machines also allow the probe angle to be controlled to allow measurement of surfaces that would otherwise be unreachable. A common use of CMM is in manufacturing of forging or machining process to test a steel forged part against the design intent. In such applications, point clouds are generated which are analysed via regression algorithms for the construction of features. These points are collected by using a probe that is positioned manually by an operator or automatically via Direct Computer Control (DCC). DCC CMMs can be programmed to repeatedly measure identical parts, thus an automated CMM is a specialized form of industrial robot. Fly Forge has CMM in house directly, so we can clearly test the dimensions of steel forgings produced in our factory. Our skilled CMM Technician can operate the testing procedure timely and accurately. Such CMM testing capability enables us to find out if there is any dimension error after forging or machining. Once there is any size deviation, we can do revision in the shortest time, so that all the steel forgings are qualified before delivery. Together with other inspection capabilities, such as chemical analysis, hardness testing and other mechanical properties testing, Fly Forge’s efficient quality control achieved high praise by our clients. Need to produce complex shaped steel forgings? Do not worry, just contact us now!